The next Adopt-a-Spot Information Session is in February. Does your organization already have an adopt-a-spot? Or want to know more? At least one rep from each organization that has an adopted spot (or is interested in getting one) should attend. New officers who have not attended the info session in the past are strongly encouraged to attend. Starting in Fall 2016, KCB has been visiting each RSO once every two years - 1/4 in fall 2016, 1/4 in spring 2017, etc. Have we missed you? Contact KCB now to arrange for a visit to your organization. Explore this map! Click on group name or on street to see which group has adopted which spot. Volunteer to make a big difference on a regular basis according to your availability. The Adopt-a-Spot program is designed for volunteer groups or individuals in a cooperative effort to clean, maintain, improve, and beautify our local environment. These areas include any unsightly public littered places that need our care for their improvement. The informational packets cover everything you could want to know. The basic rules are: try to pick up litter at least once a month. 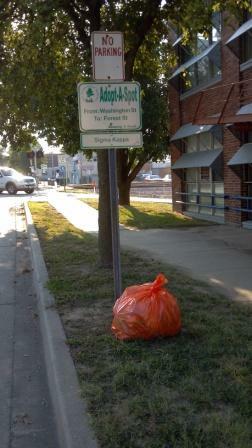 Use orange bags for litter to be left on the street for Maintenance and Environmental Services to pick up. Call them at 457-3275 and let them know where the bags are (okay to leave a message). Orange bags and disposable gloves can be picked up on the 3rd floor of the Student Center (Room 318 - Office of Student Engagement), OR at Hickory Lodge (Park District Office on Sycamore), OR at Building and Neighborhood Services (City Hall 2nd floor). Call KCB at 525-5525 if you have questions. Informational Packets are available in the Office of Student Engagement (Room 318 of Student Center). That includes the application form to adopt a spot. You can also pick up the Adopt-a-Spot documentation form there. All three can be downloaded to your computer ... right now. See below. Want to adopt* your own spot? If your group has a Spot, or wants to have a Spot, KCB can send a guest speaker to your meeting. – KCB provides bags and gloves. Contact us for more information, to have forms emailed to you, and to schedule a guest speaker.